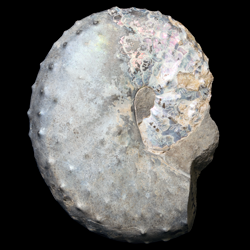 A specimen of the ammonite Disoscaphites conradi from the Yale Peabody Museum collections. Learn more on the Cretaceous Atlas of Ancient Life. The Cretaceous World TCN project is off to a great start. In total, >2700 Western Interior Seaway (WIS) localities have been georeferenced, >113,000 WIS specimens have been databased, and >10,000 WIS specimens have been imaged across all of the TCN partner institutions. While still under active development by PI Hendricks (Paleontological Research Institution), the Cretaceous Atlas of Ancient Life is now online and may be accessed at www.cretaceousatlas.org. Hendricks has also begun working on the Digital Encyclopedia of Ancient Life, an online, open access “textbook” on paleontology. A sample first chapter on “The Nature of the Fossil Record” is now online. In the middle of September, PI Lieberman and co-PI Chris Beard–both of the University of Kansas–went to western Kansas and visited some of the classic fossil bearing localities in the Cretaceous chalk. These deposits preserve spectacular specimens of mosasaurs, pterosaurs, fishes, and also invertebrates. The goal was to document these localities using GigaPan images so that researchers and general public from around the US (and the world) can view the localities, see what they look like, and get a feel for what it is like to be out conducting field work in these chalk deposits. TheGigaPan images have been made available for two of the most famous localities: Monument Rocks and Castle Rock. In the future and as part of the project we will be adding various metadata to these images on the web that will include information on and images of fossils discovered here, famous paleontologists who have visited these places, the environments preserved, etc. Castle Rock, Gove County, Kansas: an outcropping of Cretaceous rock formed when Kansas and much of the central North America was covered by an ancient ocean. In early November, PIs Bruce Lieberman (Univ. Kansas), Talia Karim (Univ. Colorado), and Jon Hendricks (Paleontological Research Institution) attended the 2016 iDigBio Summit in Chattanooga, Tennessee, which was an excellent opportunity to meet new colleagues and find out more about their TCN projects, as well as iDigBio-related activities. At the Yale Peabody Museum (YPM), staff led public tours of the YPM Invertebrate Paleontology Division collections for 32 individuals, emphasizing Cretaceous World collections and research. Additionally, PI Susan Butts gave a Peabody Gallery Talk on Nov. 17th about the Cretaceous World digitization project, research, and the utility of museum collections. YPM staff Jessica Utrup, Susan Butts, and Talia Karim (Univ. of Colorado) also led an online webinar to help various members of the project understand and proceed with georeferencing.